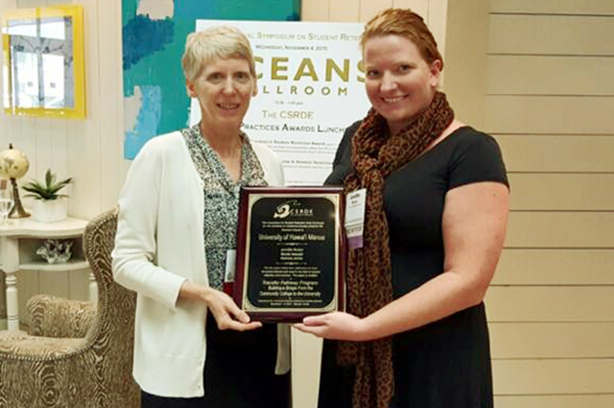 Orlando, FL – The Consortium for Student Retention Data Exchange (CSRDE) at the University of Oklahoma presented four awards during the recent eleventh annual National Symposium on Student Retention held in Orlando, FL. The CSRDE hosts the symposium in order to provide a forum for administrators, faculty and staff from institutions of higher learning to share the most current research on student retention and success. More than 115 presentations were given this year, including 69 peer-reviewed papers, as well as tutorials, workshops and a poster session. More than 450 participants attended the conference from 229 institutions in 45 states plus the District of Columbia, Puerto Rico, Canada and Australia. 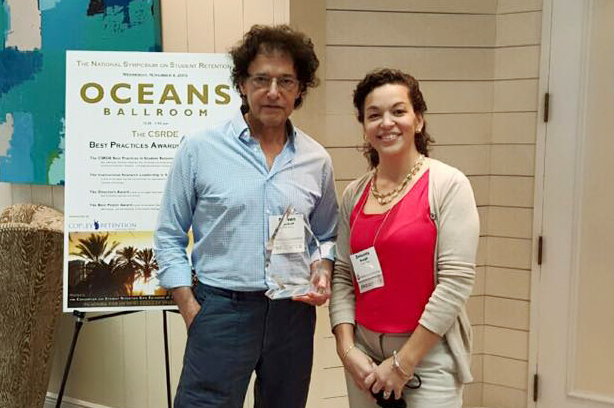 The 2015 Best Practices Award was given to Lehman College-CUNY for the paper “Third-Semester Retention Success: Lehman College’s Freshman Year Initiative Program” by Steven Wyckoff and Zenaida Bough. Best Practices Award winners must demonstrate evidence of a system-wide approach to the institution’s retention issues. Lehman’s Freshman Year Initiative program is one of the school’s major retention initiatives, built on a learning community cohort structure aimed at comprehensive intervention in the academic experience of freshmen. These communities are based on curricular integration of linked courses, resulting in an interdisciplinary approach to first-year studies and builds awareness of the critical importance of integrating first-year students into the college community. 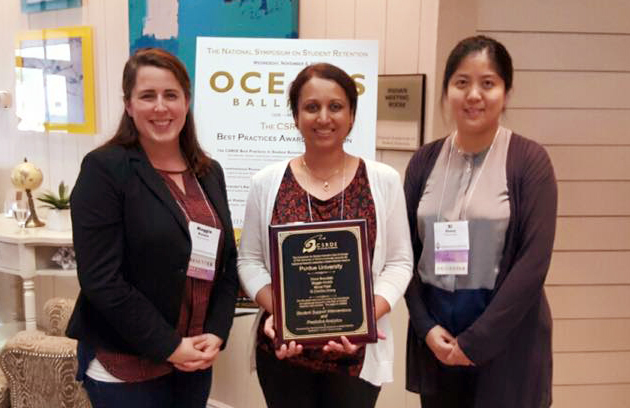 Purdue University was awarded the Institutional Research Leadership in Student Retention Award for the paper “Student Support Interventions and Predictive Analytics” by Diane Beaudoin, Maggie Konich, Monal Patel and Xi (Cecilia) Zhang. The paper identified a model to predict new students’ first semester cumulative GPA and determined the fit of that model if the student experienced one or more student support interventions. Based on the predicted GPAs, potentially at-risk students were identified and intervention services were targeted specifically to them. The latest data showed students who experienced an intervention had statistically significant higher GPAs than those who did not have any intervention. The Director’s Award went to “Transfer Pathway Program: Building a Bridge from the Community College to the University” as the paper that best addressed an issue of current interest and need in the field of student retention and success. The paper, written by Jennifer Brown, Nicole Iwasaki and Melissa Jones, discussed an existing transfer partnership between community colleges and their institution, the University of Hawai‘i Mānoa. The Western Association of Schools and Colleges report in spring 2011 revealed that, compared with other students who transferred via the regular method, students in this transfer program had a higher grade point average and a lower attrition rate. 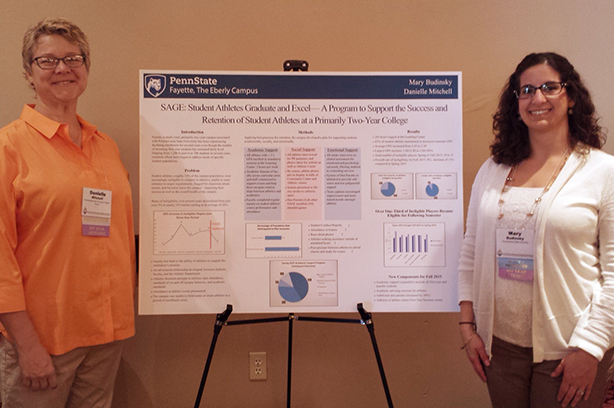 The Best Poster Award was given to Penn State Fayette Campus for “Becoming SAGE: Learning from the Past and Retaining Student Athletes at a Rural, Primarily Two-Year Campus,” designed and presented by Danielle Mitchell and Mary Budinsky. The poster showed how campus leaders tried to learn from past mistakes to develop a systemic program (SAGE—Student Athletes Graduate and Excel) to support the integration, cognitive development, satisfaction and success of student athletes. The CSRDE has a diverse membership of more than 400 colleges and universities—two- and four-year, public and private—with the common interest of achieving the highest levels of student success through sharing data, knowledge and innovation. It is operated by the Center for Institutional Data Exchange and Analysis at the University of Oklahoma Outreach.